The koala (Phascolarctos cinereus) is an ash-colored, thickset, arboreal, herbivorous marsupial averaging about 9 kg in weight. A rather stout, virtually tailless creature, with a cream-colored chest, the koala is native to Australia, and the only extant representative of the family Phascolarctidae. Heavily relying on a societal environment, koalas search for areas with eucalyptus trees dense enough to feed a full group of koalas. Therefore, even controlled deforestation can present a problem to the koalas, as they rely not only on sufficient nourishment, but on a supportive community. The koalas of South Australia were largely exterminated during the early part of the twentieth century, but the state has since been repopulated with Victorian stock. Among threats to current koala populations are habitat destruction, disease, and attacks from feral and wild animals. On the other hand, in some areas, such as certain islands, the introduction of koalas has lead to "pest" populations, since they thrive in the absence of predators and competition. Humans in recent years have been advancing their role as stewards of creation by protecting the koala populations, while also devising methods, such as sterilization, to deal with the overpopulation in certain regions. In popular Western culture, the koala is usually either depicted as cuddly and innocent, or as a curmudgeonly character never terribly impressed by the things he sees around him. In reality, koalas can be dangerous to humans. The koala is found all along the eastern coast of Australia, from near Adelaide to the southern part of Cape York Peninsula, and as far into the hinterland as there is enough rainfall to support suitable forests. However, the koala reaches into neither Tasmania nor Western Australia. The koala is broadly similar in appearance to the wombat (the closest living relative), but has a thicker, more luxurious coat, much larger ears, and longer limbs, which are equipped with large, sharp claws to assist with climbing. Weight varies from about 14 kg for a large, southern male, to about 5 kg for a small northern female. Contrary to popular belief, their fur is thick, but not soft and cuddly. Koalas' five digits are arranged with opposable thumbs, providing better gripping ability. The first two digits are positioned in apposition on the front paws, and the first three digits for the hind paws. The inverted thumbs on the koala's back feet help for grip while the koala changes branches or eats with its front hands. The koala is one of the few mammals (other than primates) that has fingerprints. In fact, koala fingerprints are remarkably similar to human fingerprints; even with an electron microscope, it can be quite difficult to distinguish between the two (Henneberg et al. 2007). The koala has an unusually small brain. About 40 percent of the cranial cavity is filled with fluid, while the brain itself is like "a pair of shriveled walnut halves on top of the brain stem, in contact neither with each other nor the bones of the skull. It is the only animal on Earth with such a strangely reduced brain" (Flannery 2002). The koala is a generally silent animal, but males have a very loud advertising call that can be heard from almost a kilometer away during the breeding season. 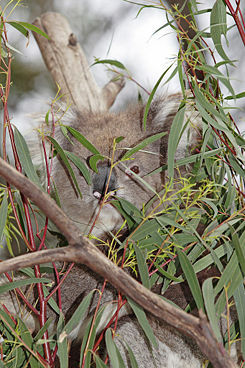 The koala lives almost entirely on eucalyptus leaves. This is likely to be an evolutionary adaptation that takes advantage of an otherwise unfilled ecological niche, since eucalyptus leaves are low in protein, high in indigestible substances, and contain phenolic and terpene compounds that are toxic to most species. Like wombats and sloths, the koala has a very low metabolic rate for a mammal and rests motionless for about 19 hours a day, sleeping most of that time. Koalas that are disturbed are known to be violent, their teeth and claws capable of providing considerable injury to humans; special handling requirements are as such applicable. Handling of koalas has been a source of political contention due to these risks, which can also cause harm to the koala as well (Jones 1995). Koalas spend about three of their five active hours eating. Feeding occurs at any time of day, but usually at night. An average koala eats 500 grams of eucalyptus leaves each day, chewing them in its powerful jaws to a very fine paste before swallowing. The liver deactivates the toxic components and prepares them for excretion, and the hind gut (especially the cecum) is greatly enlarged to extract the maximum amount of nutrient from the poor quality diet. Much of this is done through bacterial fermentation: when young are being weaned, the mother passes unusually soft feces, called pap, which is rich in these bacteria, thus passing these essential digestive aids on to her offspring when the offspring consume some of this pap. The koala will eat the leaves of a wide range of eucalyptus, and occasionally even some non-eucalyptus species, but it has firm preferences for particular varieties. These preferences vary from one region to another: in the south, manna gum, blue gum, and swamp gum are favored; gray gum and tallowwood are important in the north; and the ubiquitous river red gum of the isolated seasonal swamps and watercourses, which meander across the dry inland plains, allows the koala to exist in surprisingly arid areas. Many factors determine which of the 800 species of eucalyptus trees the koala eats. Among trees of their favorite species, however, the major factor that determines which individual trees the koala chooses is the concentration of a group of phenolic toxins called formylated phloroglucinol compounds. There is little reliable information about the lifespan of the koala, but in captivity they have been observed to reach the age of 15 years. Females reach maturity at 2 to 3 years of age, males at 3 to 4 years. If healthy, a female koala can produce one young each year for about 12 years. Gestation is 35 days; twins are very rare. Mating normally occurs between December and March, the Southern Hemisphere's summer. A baby koala is referred to as a joey and is hairless, blind, and earless at birth. The joey is only a quarter of an inch long at birth and crawls into the downward-facing pouch on the mother's belly (which is closed by a drawstring-like muscle that the mother can tighten at will) and attaches itself to one of the two teats. 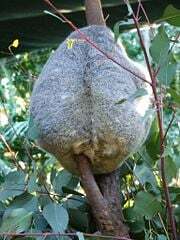 Koalas retain the rearward-facing pouch of their terrestrial vomaboid ancestors. Young remain hidden in the pouch for about six months, only feeding on milk. During this time they grow ears, eyes, and fur. The joey then begins to explore outside of the pouch. At about this stage, it begins to consume small quantities of the semi-liquid form of the mother’s excrement called "pap" in order to inoculate its gut with the microbes necessary to digest eucalyptus leaves. The baby koala will remain with the mother for another six months or so, riding on her back and feeding on both milk and gum leaves until weaning is complete at about 12 months of age. Young females disperse to nearby areas at that time; young males often stay in the mother's home range until they are two or three years old. Of particular contemporary interest is recently observed female behaviors that some have labeled as homosexual behavior (Dobson 2007). Groups of female koalas on various occasions have participated in such interactions, and often times, a female has been seen to reject male advances while willingly reciprocating female ones. However, this behavior is strictly observed in captivity, while in the wild, koalas engage only in heterosexual behavior, so homosexual behavior may just be the result of living in an unnaturally communal environment, as the societal nature of the koalas habitat has been stressed (Dobson 2007). Although three subspecies have been described, these are arbitrary selections from a cline and are not generally accepted as valid. However, the variation from one form to another is continuous and there are substantial differences between individual koalas in any given region. Following Bergman's Rule, southern individuals from the cooler climates are larger. The Victorian koala (formerly P. cinereus victor) has longer, thicker fur, is a darker, softer gray, often with chocolate-brown highlights on the back and forearms, and has a more prominently light-colored ventral side and fluffy white ear tufts. 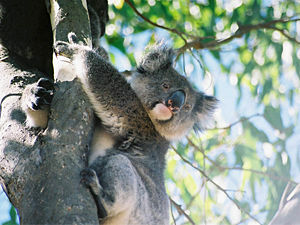 Typical and New South Wales koala (formerly P. cinereus cinereus) weigh about 12 kg for males and 8.5 kg for females. In tropical and sub-tropical Queensland, the koala (formerly P. cinereus adustus) is smaller (at around 6.5 kg for an average male and just over 5 kg for an average female), lighter and often rather scruffy gray in color, and has shorter, thinner fur. 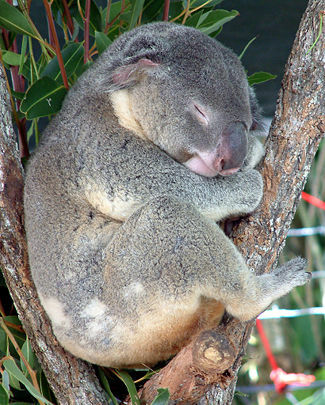 The origins of the koala are unclear, although almost certainly they descended from terrestrial wombat-like animals. Koala fossils are quite rare, but some have been found in northern Australia dating to 20 million years ago. The fossil records indicate that before 50,000 years ago, giant koalas inhabited the southern regions of Australia. During this time, the northern half of Australia was a rainforest. It is held that the koala did not specialize in a diet of eucalyptus leaves until the climate cooled and eucalyptus forests grew in the place of rainforests. The koala then began to fill the same ecological role as the sloth of South America. The koala's scientific name, Phascolarctos cinereus, comes from the Greek phaskolos, meaning "pouch," and arktos, meaning "bear." The cinereus epithet is Latin and means "ash-colored." Gula – Ngunnawal term of the Canberra region. Other aboriginal names for koalas include: Bangaroos, Koolewongs, Narnagoons, and Cholos (Burton 1974). It is commonly said that the common name "koala" is an aboriginal word meaning "no drink," although there is no evidence to support this. Koalas do drink water, but only rarely, due to their diet consisting of eucalyptus leaves. These leaves contain sufficient water to obviate the need for the koala to descend to ground level to drink. Early European settlers to Australia called the koala the native bear, and the koala is still sometimes called the koala bear, but it is not a member of the bear family. It is not even a placental mammal, which most mammals are—it is a marsupial. A review of the species national conservation status concluded that the koala is not threatened at the national level, with a population that numbers in the hundreds of thousands (Campbell 2006). This was the third review undertaken by the federal government that came to this conclusion. The IUCN lists the species as "Lower Risk/Near Threatened" (AMMSG 2006). Queensland – "Common," or "least concern wildlife," throughout the state, except in the relatively small South East Queensland Bioregion, where it is listed as "vulnerable" (Queensland Parks and Wild Life Service 2007). New South Wales – listed at a state scale as "vulnerable," but varying regionally from "secure" to "locally extinct" (NSWPWS 1999). South Australia – classified as "rare" (Australia Koala Foundation 2007). 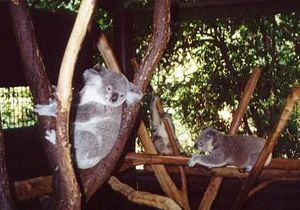 Victoria – The koala population in Victoria is considered "large and thriving" (DSE 2004). The koala has been victim to population reduction through both active and passive attacks from humans. The koala was hunted almost to extinction in the early twentieth century, largely for its fur. In recent years, some colonies have been hard hit by disease, especially chlamydia. The koala requires large areas of healthy, connected forest and these devastating circumstances have caused affected populations to travel long distances along tree corridors in search of new territory and mates. The ever-increasing human population of the coastal parts of the continent continues to cut these corridors by agricultural and residential development, forestry, and road-building, marooning koala colonies in decreasing areas of bush. The Australian Koala Foundation has mapped 40,000 square km of land for koala habitat and claims it has strong evidence to suggest wild koala populations are in serious decline throughout the species natural range. Although the species covers a massive area, only "pieces" of koala habitat remain. These pieces need to be managed, protected, and restored in a coordinated way. Presently, many are being lost to weeds, cleared for agriculture, or carved up by developers. Other threats come from logging, poor management, attacks from feral and domestic animals, disease, and roads. In contrast to the situation on much of the mainland, where populations are declining, the koalas of many island and isolated populations have reached what some have described as "plague" proportions. On Kangaroo Island in South Australia, koalas introduced some 90 years ago have thrived in the absence of predators and competition. Combined with an inability to migrate to new areas, this has caused the koala populations to become unsustainable and threaten the island's unique ecology. In particular, species of manna gum, native to the island, are being stripped by koalas at a rate faster than they can regenerate, endangering local birds and invertebrates that rely on them, and causing the extinction of at least one isolated population of manna. Koala numbers are estimated at over 30,000, with ecologists suggesting that the island can sustain 10,000 at most. Although culling, the intentional reduction and/or relocation of a species, has been suggested as a means to reduce koala numbers, with the South Australian government seriously considering such in 1996, this has been met with fierce opposition both domestically and internationally, and the species remains protected. The popularity of the koala has made the possibility of a cull politically improbable, with any negative perception likely to impact tourism and a government's electability. In place of a cull, sterilization and translocation programs have had only limited success in reducing numbers thus far, and remain expensive. There is evidence that koalas relocated to the mainland have difficulty establishing themselves in the different circumstances. A mooted alternative to the complex sterilization method, wherein the animal must first be captured, are hormonal implants that can be injected via darts. ↑ C. Groves, “Order Primates, Order Monotremata, (and select other orders),” in Mammal Species of the World, 3rd ed., ed. D. E. Wilson and D. M. Reeder (Johns Hopkins University Press, 2005 ISBN 0801882214), 43. Australasian Marsupial and Monotreme Specialist Group (AMMSG). 1996. Phascolarctos cinereus. The 2006 IUCN Red List of Threatened Species. Retrieved May 9, 2006. Australian Koala Foundation. 2007. The Koala: Endangered or Not? Save the Koala. Retrieved June 6, 2007. Burton, B., and H. Frauca. 1972. The Koala. Melbourne: Lansdowne. Campbell, I. 2006. Australian's Koala Population Not Threatened. Australian Government: Department of the Environmental and Water Resources. Retrieved June 6, 2007. Department of Sustainability and Environment (DSE). 2004. Koalas in Victoria. Department of Sustainability and Environment. Retrieved June 9, 2007. Dobson, R. 2007. Australia Rocked by "Lesbian" Koala Revelation. New Zealand Herald, February 25, 2007. Retrieved June 7, 2007. Henneberg, M., K. M. Lambert, and C. M. Leigh. 1997. Fingerprint Homoplasy: Koalas and Humans. Natural Science. Retrieved June 6, 2007. Jones R. S. L. 1995. Koalas Welfare. Parliament of New South Wales. New South Wales Parks and Wildlife Service (NSWPWS). 1999. 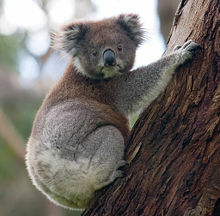 Threatened Species Information: Koala. Environmental Protection Agency/NSW Parks and Wildlife Service, New South Wales Government. Retrieved June 6, 2007. Queensland Parks and Wildlife Service. 2007. Koala Plan. Environmental Protection Agency/Queensland Parks and Wildlife Service, Queensland Government. Retrieved June 6, 2007. Wilson, D. E., and D. M. Reeder. 2005. Mammal Species of the World: A Taxonomic and Geographic Reference. Baltimore: Johns Hopkins University Press. ISBN 0801882214. This page was last modified on 21 April 2018, at 20:39.